This year I'm participating in two bees, The Bee Hive (swarm Tisha) and Do. Good Stitches charity bee. Sometimes I love the blocks I'm working on, sometimes not so much. Sometimes they stretch me in some way (which is great). At other times they are just so "me" that I could have chosen the block/color scheme myself (also great). I'm not sure who started it, but it was fun to see people start making bee blocks for others outside their bee. Like, "I love that design (or that quilter) so much that I'm gonna make her a block." I made one as a surprise for an IG friend a while back and in August I was inspired once again. My friend Mary blogs at Quilting is in My Blood. We met through the 2015 New Quilt Bloggers Blog Hop a little over a year ago. Fast forward: Last month she chose one of my favorite color schemes for her bee blocks (we're in different groups). 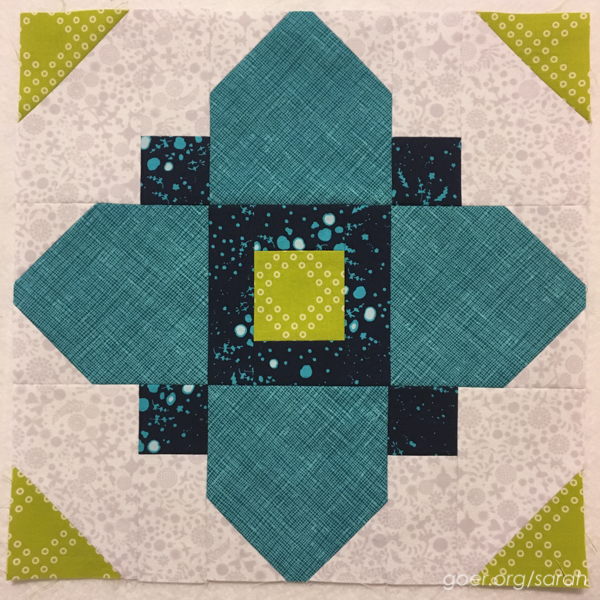 And she picked a block that I don't hate making (the Quatrefoil block). (There are a few I would be less than excited to make again.) So, voila! I made her two blocks. I hope she loves them. Her quilt is going to rock! Here's her post about her turn as queen bee, so you can check out the couple blocks she made for herself. I can't wait to see her post pics of all her blocks together. 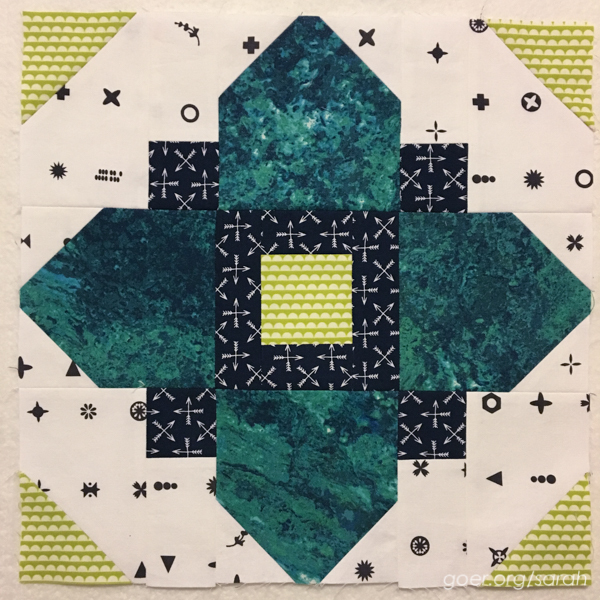 Posted in Quilting on September 5, 2016 by sarah. I know Mary will be thrilled with these, they are beautiful! Sarah, I am VERY surprised and so happy to be receiving not one, but two blocks made by you. They are just gorgeous--so you and also absolutely to my taste. It's funny not too long ago, I was wishing you were in my swarm because I thought it would be cool to have a block from you in my quilt. Sending my address to you momentarily. Thanks so much, Mary. Wow....wonderful fabrics and great blocks.